So we're at war. What are they calling this one? 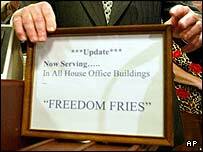 Operation Freedom Fries? We're bombing innocents on the other side of the world & I'm free to spend my birthday weekend on the river. Even now I have mixed feelings about the war & all the continuing protests. I support the protesters (though I'm not so sure about driving & flying all over the country). I support our troops (as people, though I don't necessarily agree with their support -- by violence -- of our government). In the last couple of weeks, mostly while watching The Daily Show (I love Jon Stewart), I have been able, finally, to see more than one side to the argument. Let me be clear: I am unequivocally for peace & against war. I adore my main screen squeeze Viggo for his protest t-shirts at all his LoTR interviews, but I don't think protests are the only way (it sure has been nice to see the whole world join in more than one huge protest though). Problem is, it's not just the war... watch those environmental protections disappearing, watch those courts & committees fill with Bush-heads & protest that. It's the local war that's really got me going. Call me narrow-minded (remembering it takes one to know one), but I am more concerned about the trees, fish, birds, critters, rivers, air & countless wildlands that are threatened in my own beautiful corner of the country (& all over the world) than I am about some humans in Iraq & in Washington DC (& even myself: like the Native Americans, I will die with the salmon). Maybe my attitude sounds terrible, & I will certainly admit that I am appalled to the point of tears by the horrors my government has perpetrated on so many other countries, like Nicaragua. I do not feel that I am innocent of these crimes & I want to do what I can to be part of the balance of good. The Global Vigil for Peace last Sunday was my first official protest (in the "standing around with a bunch of people holding signs/candles" meaning of the term). I would have gone to the first global protest in February but I was worshipping the river & that will always be more important to me than almost anything else. 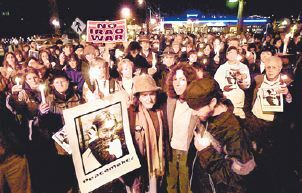 I liked that the vigil was for peace rather than being anti-war. I liked the idea & the reality of standing with people all over the world, hoping, wishing or praying for peace (or honking as they drove by -- honking for a silent vigil! ...fabulous). Our vigil in Olympia merged with a vigil to mourn the death of Rachel Corrie, a local woman who was killed by an Israeli tank in the Gaza strip while trying to protect a Palestinian doctor's house. Yep, I support her too. I'd rather die for a tree or a Florida Panther (if I were willing to abandon my family), but I have to admire her willingness to give her life for her cause. Peace is bigger than Iraq, bigger than the US (big as we are for our britches). Here's hoping we get there. For what it's worth, I've got a candle in my window & if peaceful thoughts, wishes & hopes can help, I'll be at the river having them. All this makes me really feel I'm being taxed without representation (maybe we should stage a Fry Party in Puget Sound?). I had my taxes done recently. Ouch. I work for myself, so I pay through the nose (if I had a real job, my employer would pay some of it). Twenty percent of my hard-earned cash. That sounds like a lot to me, especially since I don't even make as much as Joe Millionaire (before all the endorsements). What almost gets me madder than having to send off a big huge check to Uncle Sam is thinking of what he's using it for. Not what I want him to use it for. War & destruction. Chopping down trees, mining national parks... Who needs clean water, clean air? I mean, if human life is the only kind we value & we don't even value that, if he's gonna have a big ol' deficit even with my entire savings account, can't I just keep half & give the other half to somebody who really needs it? What helps? The Gym. I vividly remember a walk I took with my sister & her mom (Suzanne -- someday I'll explain my typical California family...) through the warm redwoods near the coast of Mendocino county when I was 7 or 8. For some reason we were discussing cellulite & I can still hear Suzanne telling me, "Watch out -- it'll hit you when you turn thirty." I laughed then & I laughed again about a year ago when I realized it'd happened. We finally joined The Valley & I am being a very good girl so far (still enjoying it too, maybe that's why). I love the weight routine & elliptical machine so much that I haven't even been in the pool yet. Flaming Lips - the latest album, Yoshimi Battles the Pink Robots, is yet another delight (you can listen to it all on their website: flaminglips.com). It's certainly more polished than the old stuff that makes no sense but still manages to move me (there's a song about planets colliding in the hall that just kills me). Now their music is smoother, makes more sense & it still moves me. Last night, listening to them as I drove home from the gym, I could have cried. Sustainability. We humans are not better than any other life form -- at least not if we continue to so busily & thoughtlessly destroy them all. I grew up on the beautiful Mendocino coast, with the heart-stopping headlands on one side & the majestic redwoods on the other. We used to go down to the river when it was hot in the summer. Usually we swam in Big River or Little River, the names of which seemed perfect to me (even though Big River wasn't really that big). Things were simple for me then: watch the nettles (but if they get you there's always bracken fern to take away the sting) ...& it's worth the cold swim through the shade to jump off the big rock on the other side. But we drove down to the river on the logging roads & one time all of a sudden we would go down to a favorite spot to find most of the forest along the way missing. I'll never understand why we have to make big piles of dead trees to drive by on the way into towns all over the West... That was probably what started to make things less simple for me... yeh, that & of course my parents' divorce ...see, most of the time I grew up in Sacramento with my mom & there's a great river there too (two), but my heart belongs to Caspar. I know what will happen for me after I die: my ashes will be set among the roots of a tree, maybe a peach tree, in Caspar with the rest of my family. ...& it didn't so much make things less simple as more so: I'm human (selfish as any) don't get me wrong, but I will always be a defender of animals, fish & plants (rocks, water & air, too) before humans. It's one of the ways I weed through my non-profit pleas: I don't give money just to help humans, sorry...& yes, I would prefer that the huge bird-lively tree out in the front yard gets me than that I have any part in its death (does keep me up at night though & believe me, I've got that survival instinct so who knows? ya never know)... but no, I don't feel innocent. I am responsible for the actions of my government, even when I feel helpless to stop them. So, for a start, I'll protect that big pine while I savor the life I've got. Cooking ('o, no! after all that animal-loving talk, she's an omnivore?!' yep... hey, if it was good enough for my ancestors... I've learned to love the contradictions -- haven't you seen my flyfishing pages?). The Greek egg-lemon soup, Avgolemono, makes me feel extra warm & happy as I sit watching the birds in the rain outside my window. When I make Sarah's Creamy Carrot Soup, I usually also make Carrot Cake too (we don't have dessert very often 'round here, so it's a real treat). The other day I discovered that my Corn Chowder recipe is even more versatile than I thought. I've done Clam Chowder before, but the latest variation was a delicious Potato Cheese Chowder with roasted jalapeños & garlic. Click over to check out the latest recipe. Birds! Winter time is Project FeederWatch time. I spend some time each day at my window watching all the birds & keeping a list in my bird journal, then I share the list with PFW -- along with a bajillion other people all over the country. I see hawks (sharp-shinned & Cooper's) fairly often, downy woodpeckers, sapsuckers, flickers & nuthatches come for the suet, scrub & stellar's jays come for peanuts, chickadees, goldfinches, sparrows, juncos... I get close to 20 different species at my feeders every day (though they vary by season, of course). Endless entertainment! The yard & the birds have gotten me more into plants too. I've got a nice shade garden going, the troublesome area under the big pine is slowly filling in & I'm hatching plans to do away with the lawn. It's over... no more Sundays to spend cooking with football in the background all day... & what an end... That darn Gruden. I cheered him on all year & in those last two weekends paid for that in heartbreak (the worst/best in years). First the Eagles, then my Raiders. All I can say, Tampa Bay, is that Lou isn't gonna do it for you like Chucky did. I love sports. Now it's time to focus on basketball. We trekked North last Friday to see the Sixers pound the Sonics (usta be a Sonics fan, but minus my favorite rising star (Cowboy) & Seattle's long-time superstar (Glove)? ...major heartbreak in Seattle). Football is my first love, but basketball is an exciting game. Then there's hockey. I like the Flyers of course -- yes my Philadelphia boy has a lot of influence with me (but credit my brother for the Birds). I'll always love the Mariners... even the least fanatic fan would admit that it's fun to go to Safeco & shout Ed-Garrrrrrrr with the crowd. TV -- I admit it, I'm a junkie. Lately I'm giggling over those highly embarrassing reality tv shows: Meet My Folks is pretty funny, but it can't compare to the Amazing Race, now that's a good reality show (even though I hated its whining winner)... & omigawd, didja know Temptation Island's coming back! Now that's twisted. Really I'm more into movies. The latest favorites: Duets is fantastic & hilarious (who knew Gwyneth could sing?!). Tortilla Soup is delicious. Gable and Lombard is touching & fun. Lord of the Rings... love 'em. Speaking of, I just finished (devoured) The Hobbit, a lovely edition with gorgeous illustrations by Michael Hague. Having that book to read made me look forward to my half hour on the cross-country machine! Now I'm having that old small-town dilemma because I really want the 1988 box set of Lord of the Rings & I could order it from my local independent bookstore or, for at least $20 less I could have it faster from Amazon... ah... every choice is political, isn't it? Viggo Mortensen - I love a good star crush, but this beauty runs more than skin deep (now there's an easy choice -- buy his books from him, support other poet-artists). "Even if you produce something that's interesting to nobody but yourself, the activity justifies itself," says this artistic pack rat. Color me inspired. I love sewing - my specialty is pillow cases & bags of all shapes & sizes. Write me if there's something you'd like. Of course there's the pup...everybody loves Iverson. We both love to go fishing with Bob. I wouldn't say that I'm obsessed with fishing (because Bob is & it can be a scary thing), but I am obsessed with being out there & taking tons of river pictures. In the words of the o-so-quotable Homer Simpson: mmmmm, beer. John D MacDonald - you wouldn't believe how obsessively I read his cynical, honorable Florida crime stories. I also love Carl Hiaasen's bitter wit & eco-terrorist characters (I wanna be Twilly). Selective Trout - a window into another world by a couple of guys who like to be out on the river as much as I do. Teatro by Willie Nelson is a beautifully, cheerfully sad album I could listen to every day. The Songs of Almodóvar - I don't much like the director's own songs, but the songs he puts in his movies are classic Spanish love songs.